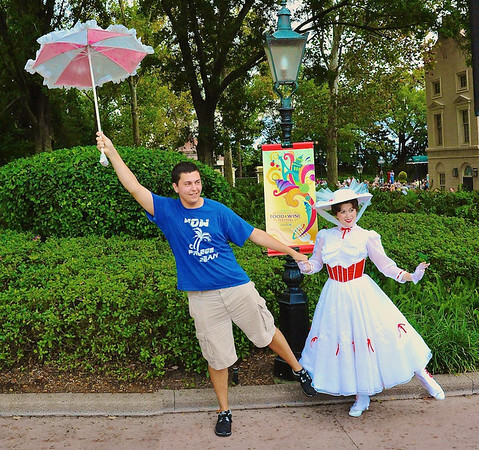 A guest on holiday poses with Mary Poppins and her umbrella at the United Kingdom pavilion in Epcot’s World Showcase, Walt Disney World, Orlando, Florida. Nikon D700/28-300VR, 1/60s, f/11, ISO 6400, EV 0, 28mm focal length. I know it seems funny to talk about the magic of a place like Walt Disney World. It is, after all, a theme park filled with rides, shows, restaurants and people. Lots and lots of people. Yet, when I visit there, I see it all around me. Adults remembering what it was like to be a kid again. Like the gentleman with Mary Poppins you see in my photo. He had walked right up to her and grabbed her umbrella and hand and struck a pose. To her credit, she went right along with it. As this post title implies, I am currently back down at Walt Disney World on holiday or vacation as us, Americans, call it. As many times as I have visited The World (as all Disney fanatics call it) there are still new experiences to see and do. 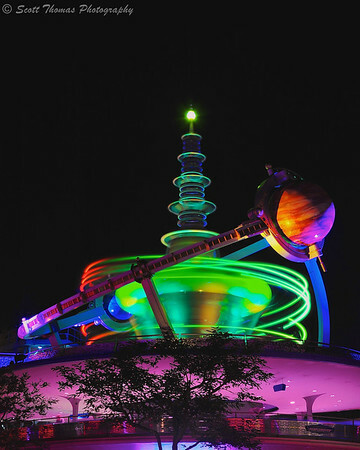 For instance, I have never ridden on the Astro Orbiter in the Magic Kingdom’s Tomorrowland. Here is a long exposure photo of it. Maybe this will be the trip I do. Astro Orbiter in Tomorrowland at the Magic Kingdom in Walt Disney World, Orlando, Florida. Nikon D700/28-300VR, 6s, f/16, ISO 200, EV 0, 55mm focal length, tripod. Throughout the year, Walt Disney World hosts special events and festivals. Star Wars Weekends runs for a few weeks every May and June. This will be my second time enjoying characters from a Galaxy Far, Far Away. Back in 2012, I photographed the Wookie, Chewbacca, taking part in the Star Wars Celebrity Motorcade. Not sure how to describe a Wookie’s roar. 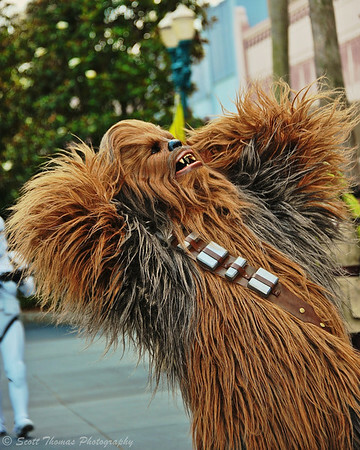 Chewbacca (Chewie) takes part in the Star Wars Celebrity Motorcade during Star Wars Weekend at Disney’s Hollywood Studios back in 2012. Nikon D700/28-300VR, 1/160s, f/5.3, ISO 200, EV 0, 112mm focal length. You can be sure I will be doing more night photography around the parks this week. It takes a little effort and planning to use a tripod but find the results well worth it. I even get good hand-held ones. As I was waiting for Cinderella to come out of the castle as it was getting close to midnight, I used Da Grip to photograph the castle in classic Disney living colors. 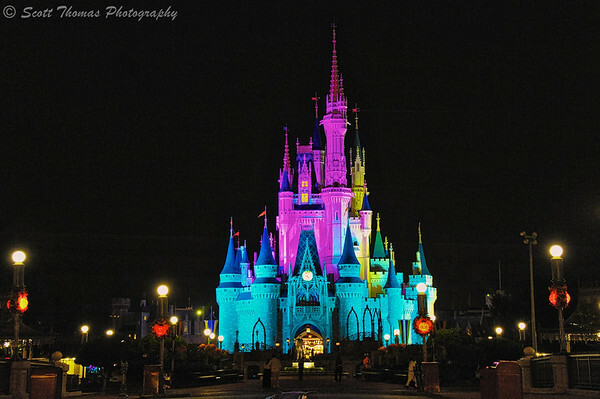 Cinderella Castle under colored lights in the Magic Kingdom close to midnight at Walt Disney World, Orlando, Florida. Nikon D700/28-300VR, 1/25s, f/4.8, ISO 6400, EV 0, 62mm focal length. As my kids and wife will attest, I am a big kid at heart, anyway. I know you will all be excited when I come back and share all my vacation photos with you. Right? As my favorite Disney character, Mickey Mouse, says, “See You Real Soon!”. For those interested, you can follow me along via my Disney Twitter feed at Scottwdw (click to see and/or follow). She has been booking and planning Disney trips for satisfied travelers exclusively for over 18 years. This entry was posted in Travel and tagged 28-300mm, astro orbiter, blur, chewbacca, cinderella castle, da grip, disney's hollywood studios, epcot, florida, long exposure, magic kingdom, mary poppins, motion, movement, night, nikon D700, orlando, star wars weekend, sww, tripod, united kingdom, vr, walt disney world, wookie, world showcase. Bookmark the permalink. Your Mary Poppins theme intrigued because I just saw the movie “Saving Mr. Banks” about the story-behind-the-story of Mary Poppins this week. Have you seen it? P.S. It’s cool that you’re still a big kid at heart. Yes, I saw the movie in the theater last December and now own the Blu-Ray. I thought it was well done. Did you watch the credits long enough to hear the taped conversation from the real P.L. Travers? She was one amazing women and Walt found the key to her heart. Yes, I watched until the end. Fascinating!